It’s 2018 and we’re still fighting the same battles over the teaching of evolution (and now climate change) in our schools that have been ongoing for decades. Bills filed during this year’s state legislative session targeted so-called “controversial theories” taught in science classes. Citizens and school board officials recently attacked fact-based science textbooks in Nassau, Collier, and Marion Counties and possibly others. A concerted effort to unleash yet more money to go to private schools that teach creationism while denigrating evolution and other basic science topics is gaining steam. Learn more about these ongoing battles by exploring the Issues tab at the top of this page. Florida Citizens for Science is a statewide organization that was established in 2006 with the purpose of promoting and defending quality science education in the Sunshine State. We’ve been at the forefront of the endless battles over textbooks, our state science education standards and repeated attempts to undermine science education by state and local elected officials. Our success depends on you. Please join us in our fight on behalf of our students, schools and future. Going Ape: Florida’s Battles over Evolution in the Classroom. For nearly a century, Florida has been a key battleground for the teaching of evolution in public schools. Before he successfully prosecuted Tennessee teacher John Scopes in the infamous Scopes Monkey Trial, William Jennings Bryan was a prominent anti-evolution agitator in Florida. More than ninety years later, tensions still run high on both sides of the issue, erupting regularly and sometimes spectacularly. Personally involved in the Florida evolution dispute since 2006 as a founding board member of Florida Citizens for Science, author Brandon Haught is uniquely poised to present this dramatic conflict from an insider’s point-of-view. His eye for rich detail enlivens this engrossing saga as it stretches across the decades of the twentieth century and into the present. Given a social climate where the teaching of evolution continues to sharply divide neighbors and communities, Going Ape is a must-read for anyone concerned with the future of public education. 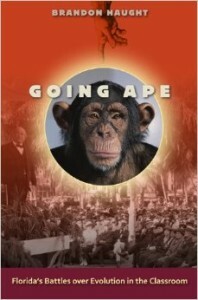 Learn more about Going Ape at the author’s website. Available at the University Press of Florida, Amazon or other booksellers.